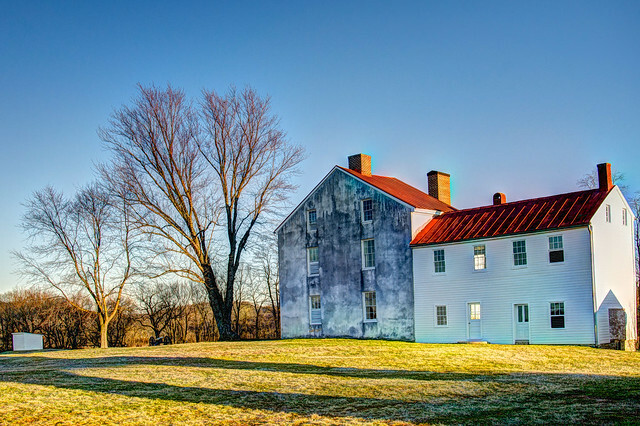 I didn’t know I could have such a volatile relationship with a house until I began working for the National Park Service at Monocacy National Battlefield in Frederick County, Maryland and ran across a crumbling 18th century farmhouse called L’Hermitage. As an all-around nerdy kid, I was no stranger to museums and tours of historically important buildings. I would “ooh and ahh” at the opulence, dragging my mother to a new and exciting room while my sister yawned and grumbled in the background. Anyway, as I drove to the park headquarters on the morning of my first day at the battlefield, however, I was introduced to L’Hermitage, a sprawling plantation that completely revolutionized my understanding of history and how I perceived the historic houses that I adored so much as a child. L’Hermitage (known as the Best Farm after the Civil War) was always kind of an anomaly. The Vincendières, a family of French colonists from St. Domingue (present day Haiti), founded the 748-acre plantation in 1794 after fleeing the unrest associated with the onset of the Haitian Revolution. Almost immediately, they made their presence in the largely German-Protestant community known. Their worldview was in stark contrast to that typical of central Maryland at the time, and was made apparent by their grandiose plantation and the system of slavery they enforced. The first time I was able to explore the property I was struck with that familiar, childlike sense of wonderment. The main structure, a stunning white house with a hipped roof, stands out against the rolling countryside. Even the inside, devoid of furnishings, crumbling and ridden with holes, was magnificent. The paint chipping from the walls and high vaulted ceilings were still the original to the two centuries old house, giving the dwelling a powerful tomb-like atmosphere. It was beautifully creepy. I vividly remember standing in the front doorway thinking that places like Monticello and Mount Vernon had nothing on the lesser-known L’Hermitage. But here’s what struck me the most — it was refreshing to not be force fed history, allowing it instead to flow freely and unadulterated by velvet ropes and guides dressed in colonial garb. The story of the Vincendière family captivated my thoughts, and the shell of their house became the perfect conduit for my mind to be transported to a place and time that I was wholly unfamiliar with. The deeper the other researchers and I dug (literally and figuratively) into that story, however, the more complicated my fascination became. Wondering what made it so complicated? Or how this relates to what we’re doing at the Latimer House? Keep checking back to read Part II. « Check out what’s going on at the Latimer House!